The oil tank removal site sits behind the Lillis Building in New Milford on Tuesday. NEW MILFORD — The Board of Education and Town Council are at odds over the cost of an oil tank replacement project. Some town council members doubt the school board’s ability to oversee capital projects with the recent request for more money — essentially doubling the cost to replace an oil tank at the central offices. School officials say a lot of unforeseen challenges with the tank replacements are the cause of the extra cost, while some council members say the contractor is overcharging the district. The schools are asking for an additional $80,000 or so to the $105,000 the Town Council already allocated for the project. “We hope we’re getting to the end and we hope we won’t need the contingency,” Interim Superintendent of Schools Stephen Tracy said. The contractor, ETT Environmental, which is also replacing oil tanks for the town, will have to come before the Town Council to answer questions before any additional money is released. All of the tickets for the material hauled away will have to be given to council members as soon as possible. Szymanski, who has 20 years of experience in construction, said the jackhammer in the picture of the site is not the equipment the contractor is saying the schools rented for a month. He said three people were not needed to complete the work, which is usually a one- or two-person job, and the district was being charged five times the usual amount for some of the basic functions like removing the debris. “These numbers are absolutely absurd and ridiculous,” he said. School officials defended the costs by saying the tanks have encountered a series of problems largely due to how the tanks were originally installed. “I think that’s an oversimplification of what’s going on,” Facilities Director Kevin Munrett told Szymanski, adding the district rented three different jackhammers throughout the project. School officials said the tank removals have encountered a series of problems, beginning with the initial discovery in fall 2017 that the tanks would be needed to be replaced. While pulling permits to install check valves on the tanks, school officials learned some of the tanks were never registered. During the district’s investigation, it came to light that three of the tanks would have to be replaced because of their age. The state Department of Energy and Environmental Protection requires fuel tanks be replaced when they hit 30 years — a deadline established by the manufacturers and enforced by the state. While replacing the tank at Hill and Plain Elementary School, workers discovered the school’s electrical transformer and switchbox were on top of the tank, causing them to just seal and abandon it in place and order a new, above-ground tank. The extra work led the school board to spend $70,000 above the approved $92,000. 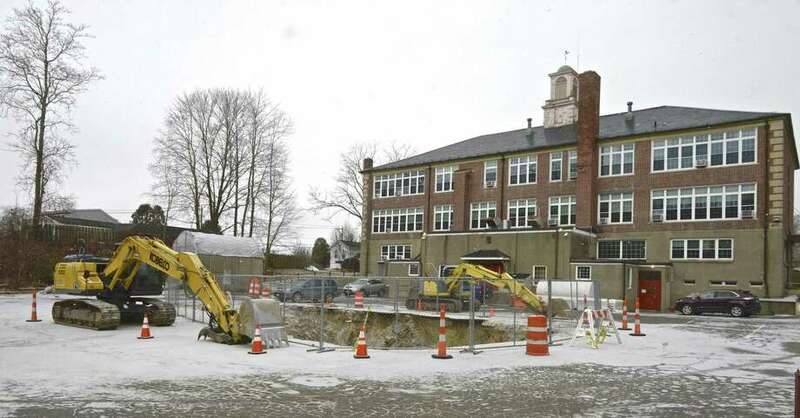 At the Lillis Building, which is where the schools’ central office is housed, workers discovered the old tank was installed just three inches below the asphalt, when regulations call for 18 inches to 24 inches of cover. They encountered a lot of ledge and boulders as they were digging the deeper hole, causing the costs to go up. They also had to do it in a new location because they found an old sewer line. Szymanski said the school board should have changed to a smaller tank and known from the ground radar test that the original tank wasn’t deep enough and a new plan needed to be created. He said the town entrusted the school board with a lot of money and questioned the school officials’ ability to oversee these capital projects. “At this point, I’m very concerned,” he said, adding the school employee should be held responsible. Some council members agreed there should be accountability and suggested the schools have to pay for the new costs. Tracy said he decided to proceed with the work because he considered it was urgent since the replacement deadline was Dec. 31. Munrett said a smaller tank would have taken another 10 weeks, which they didn’t have. If a tank is left in the ground after this deadline, the district could be charged a $10,000 fine for each tank and then a daily fine until it is removed.